It has been a difficult couple of weeks over here since Chris’s surgery hence my lack of posting, but we are trying to focus on when he’ll be fully recovered and able to lift more than five pounds. While there isn’t a lot of reno going on, there’s more planning than ever–which is helping to keep us in good spirits and motivated. As soon as Chris is in the clear, we are going to hit the ground running. Watch out! We have spent the last year planning a kitchen renovation and that’s not even an exaggeration. We went back and forth on everything from finishes to layout. I am happy to report we have the layout nailed down and most of the finishes we’re leaning toward too. Almost everything is changing or shifting in the kitchen and behind the walls, too. We’ve talked a lot about moving our laundry area to make room for a walk-in pantry. But hopefully this floor plan gives you an even better idea of what that will look like. The walk-in pantry will have plenty of shelves for goods, but also an ice machine (hopefully pebble ice! :) and a chest freezer tucked away in there, too. We use fresh food and produce more than pantry goods and way more than anything frozen, so this is what really makes the most sense for us. Moving into the kitchen area, you’ll see we’ll be bumping the wall where the all-refrigerator will sit back so the fridge and cabinets accompanying it will be recessed and flush with the wall where the sliding door is. We actually made one additional change on that wall, instead of narrow cabinets on either side of the all refrigerator, we opted for tall cabinets to the right which will house a built-in microwave. Looking straight into the kitchen, we’re adding twin windows on either side of a 48″ professional range and hood (although we’ll probably build some sort of surround for the hood). Not pictured in these floor plans is, well, a lot–we drew them up using the Ikea kitchen planner sooo–but the wall sconces that will hang above each window will really make that wall a feature of the great room for sure. The left wall will be the new home for our sink. The dishwasher will almost stay in the same place and a huge window will be framed by cabinets on all sides. The island will have an overhang on the side closest to the dining room, instead of to the right where it is now. We can tuck a couple stools there for overflow seating when we have dinner parties or casual snacking while Chris cooks–something we’ve become accustomed to. We decided to go with Ikea for the cabinets. We have heard so many great things about Ikea cabinets (although you might have heard us swearing at our computers when using their kitchen planner…right!?) and can’t wait to use them for our new kitchen. While we’ll be saving on cabinets, professional appliances are definitely a splurge, but something that, again, makes sense for Chris who has a degree in culinary arts, a passion for food and perhaps most importantly–cooks for us every day of the week. Finally, here’s a glimpse at where we’re headed as far as finishes go. 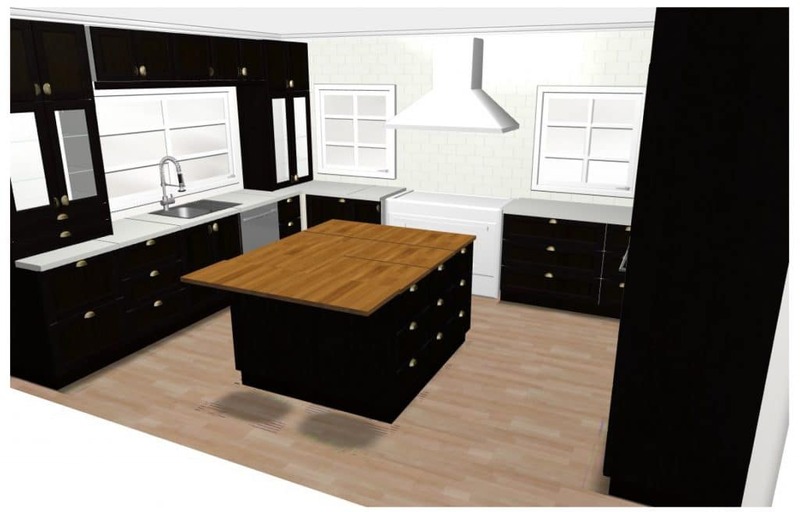 Dark cabinets with light countertops around the perimeter and a chunky walnut butcher block for the island. We thought that clear glass pendants for the island would provide light without visually interfering with the dining room chandelier. And those wall sconces for above the window pair so well with the hardware. Ooo. I just can’t wait! We hope it will feel sophisticated but cozy, too, and something we’ll love for decades to come. 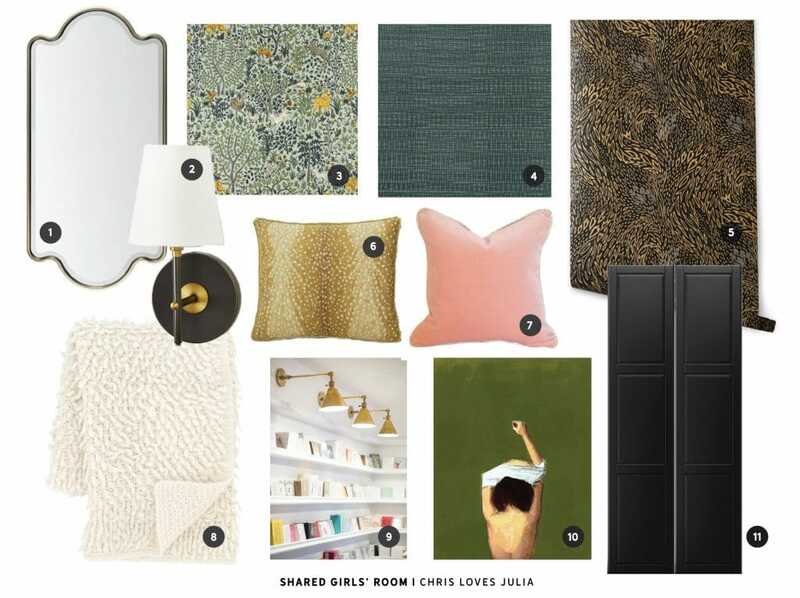 You can check out more of our inspirations for the upcoming reno here. Lights On In the Kitchen! This design is so great, I really want to do something similar but I need to incorporate tile floors. Do you happen to have any suggestions, what tile would you choose for your kitchen if you needed to go that direction? Thanks in advance! Hi Kirsten! Our floors are actually tile – they’re faux wood ceramic. You can see the finished kitchen here. The new layout makes so much sense and it’s amazing! Thank you for sharing. I love the wooden appliances in my kitchen. also love the big island. 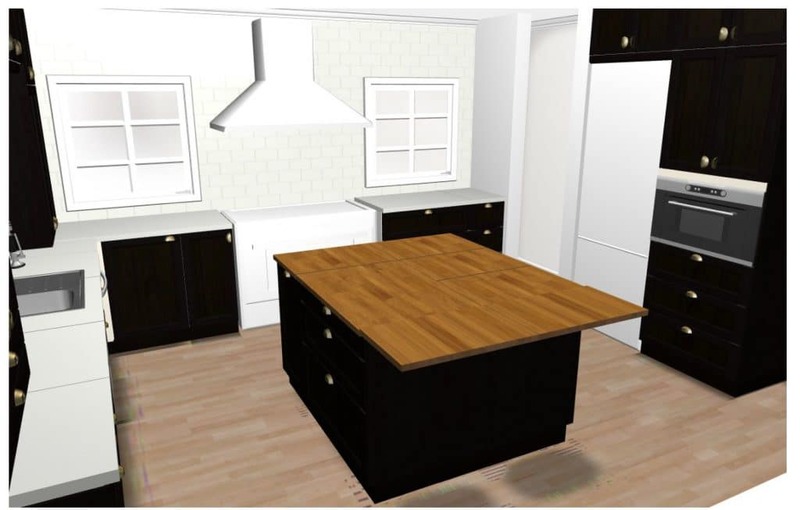 Love your blog and am so interested in the interim and finished kitchen. I’m glad to hear you love IKEA cabinets; did you do the layout all online. I am thinking of reconfiguring my whole kitchen and possibly taking a wall out and bumping out the bay window on the deck. Before I get carried away; I have one question, where do you suggest to get started as the whole idea is overwhelming? I have your blog on my toolbar and so excited to see yours complete. That is a dream kitchen and family space. I have serious pantry envy, just sayin. There will be an echo in there with all of that space. We have a laundry room/mudroom combo and are in the process or revamping, redoing, and making bigger. I think it can be done, but takes a lot of organization. Ours opens up to the garage (which I think yours might too) and keeping it clutter free is a must for all of the traffic going on. Just found your blog and am loving it so far! I will be following along from now on. While we didn’t use IKEA cabinets in our renovation, I did use their planner to decide on layouts. I agree with your (unspoken) frustration! It took me forever to get the hang of it. We did the work ourselves too but hired out for the big things we don’t feel comfortable tackling, namely electric and counter install. Can’t wait to see you get started! I would also strongly recommend a 2nd dishwasher (but not the drawers.) My husband suggested it but I didn’t want to spend the money and we were working with the cabinets from the previous owner since they were new. Now, I wish I had it since my 2 kids are getting older and I run a minimum of 2 loads per day, most days are 3. I think part of the problem is that the newer machines take so long to run. That, and I have to sanitize everything-just my pet peeve. Just something to think about. Glad Chris is feeling better! I love Dana! We always joke we could co-exist very effortlessly because our styles are so similar. Is there anything more exciting than making plans?? I honestly can’t decide whether I’m more excited about the kitchen or the laundry/mud room. I am so looking forward to following along with this renovation, thanks so much for sharing! All best wishes for Chris’s continued healing and everyone’s general good health. The plans look great! 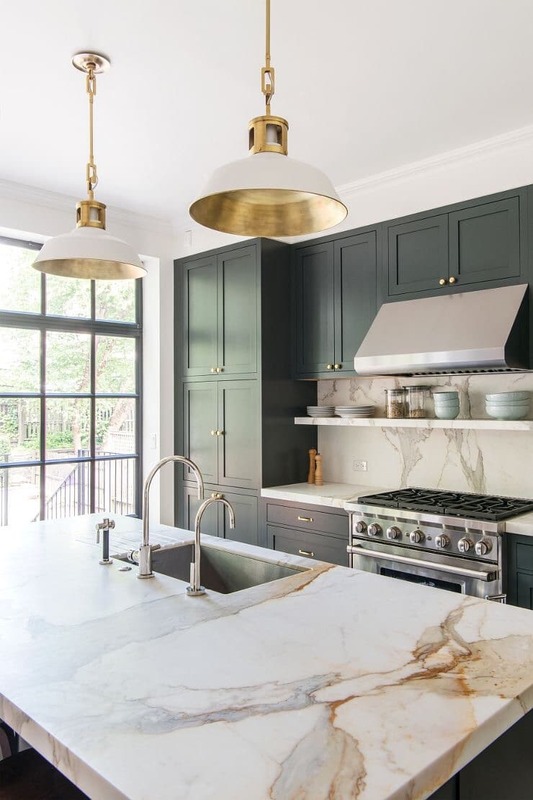 I love the touches of gold and glass balance the cabinets nicely. We redid our kitchen with Ikea cabinets three years ago (Adel doors) and I still love it. The new cabinets options from Ikea are exciting and I wish they had them three years ago though. :) From what I read from Ikea, the core cabinet features and functionality will be the same. I can confirm how great Ikea cabinets are! The drawer and cabinets close well and have great storage. The pantry cupboards are great too. The change will be fun to watch! Are y’all getting that range?!?! Those are amazing for cooking! So LOVE the scones as well and can’t wait to see this all come together! I love the way your pantry will be such a functional space! Just my two cents – my parents also have a two drawer dishwasher and I do not think it will be functional for a family of four. It is okay for them because it is usually just two people for dinner and they can just run the top drawer. I have a family of five and it would never be big enough. You lose a lot of space with the drawers, and besides being interesting to look at, there isn’t really any other advantage except for maybe one or two people. And one other point about the range hood….we recently built a house and just went with a standard stove/range hood that is vented outside. Our builder told us to get one with 400 CFM’s (generally the 30 inch ones) or else he would have to do something different to the furnace to allow it to backflow or properly vent outside?? Sorry I don’t have the specifics. I know our neighbor got a 48 inch vent hood and they had to pay more for the furnace venting. Just a note to look into it if you haven’t already. Can’t wait to see the new IKEA cabinets go in! We are thinking about using them in our basement. That is so, so interesting and something I didn’t even think twice about. Thanks! New reader here! 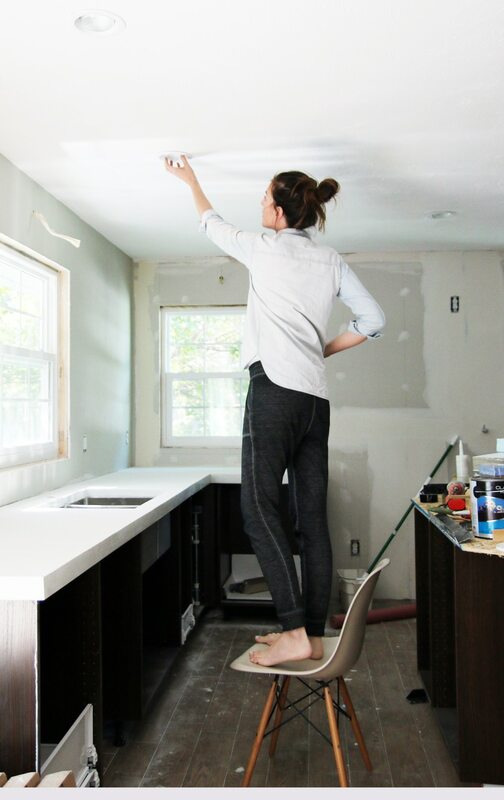 What a great post to start with :) We are in the midst of our own kitchen renovation (we’ve gutted the whole thing and are starting anew) so it’s really neat to see someone else’s method to the madness! We were hoping to hold out for IKEA’s new cabinetry, but the closest store is too far away for us to make multiple trips there unfortunately. We’ll be doing our best to “trick out” our cabinets with pull-outs and other storage options :) Will you be sharing more about what cabinet/storage options for things like spices/pans, etc. you decided to go with? And, if you don’t mind me asking, where are you getting your butcher block from? We definitely will. Our closest Ikea is 4 hours away, but we’re making our first trip in 2 weeks and luckily we have family there so it gives us an extra excuse. :) The butcher block is from craft-art. We used them for our last kitchen’s countertops and absolutely love them (http://www.chrislovesjulia.com/2013/07/the-kitchen-before-and-afters.html). Although, we are thinking about going with an end grain option this time–we’ll see! Love the new kitchen layout! Also in love with IKEA’s newest release (which I’ve been poring over as well for our spring kitchen reno). Question regarding your old kitchen for a sec – the knifes on the magnetic strip — we’re wondering about doing that to get rid of the counter stealing knife block, is it awkward reaching across the counter/stovetop? Or are you planning on using the in drawer knife block from IKEA? Uhh, hmm. It’s not awkward for us. We have plans to put a magnetic strip on the right wall before you head into the pantry in the reno, but we are going to Ikea in a couple weeks and we’ll definitely check out the in-drawer organizers. Right now Chris has his most used knifes on the strip, his second most used in a knife block on the counter and third strings in a drawer. He even has a back-up set stored in his knife bag. thanks for the input. The location for your knife magnetic strip makes sense – right next to a lot of prep counter space. This is exciting! It looks very beautiful. 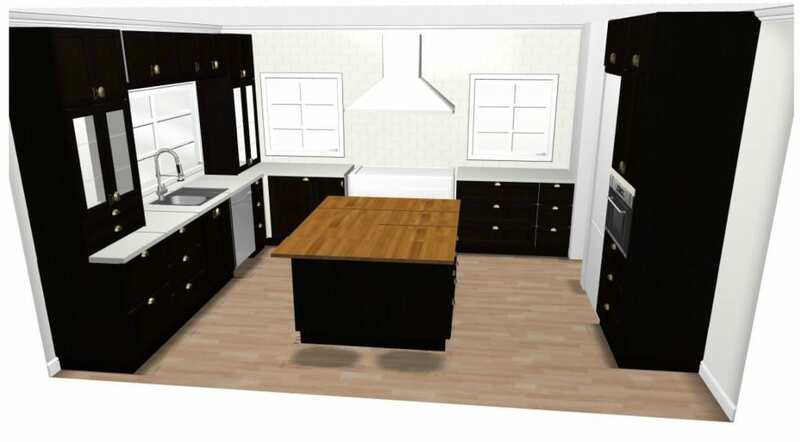 We’ve been preparing for a new kitchen and I’m knee deep in planning. I’m curious about a few of your floor plan choices since you seem to cook A LOT more than we do. I read a kitchen designer mantra “Ice-Water-Stone-Fire” which basically means you should plan your layout in order of fridge-sink-prep-range and also the NKBA recommendation that no leg of a work triangle should intersect an island by more than 12 inches. I’m just wondering if-as chefs-you find that these recommendations are not necessarily rules to worry about or are you choosing to compromise a bit of floor plan efficiency for the sake of aesthetics? I think I’m a bit on information overload and practically have the NKBA guide memorized at this point. Curious about how you arrived at this floor plan as we’re working ours out. Hi Sarahlou! Great question, and I’m a big fan of the cooking triangle. It essentially ensures that any cook can come into your kitchen and cook comfortably. BUT, how important it is that you follow these guidelines is really subjective. Myself, I rarely take things from the fridge and go straight to the sink/stove with it. As part of my culinary training they talk about “mis en place,” which simply stated means to prepare everything before you cook. So all of my ingredients get laid out on my prep area first, and from there I divide, wash and cut it before cooking. So the fridge being on the other side of the island (I am most comfortable prepping at the island with my back to the sink) isn’t a concern for me, because I can still take things from the fridge and put them on my prep area without any obstacles. And if I need to quickly add a splash of cream to my soup or soy sauce to a stir fry, the path between the fridge and stove is clear enough for it to work just fine. Hey, I see part of the comment I was going to make has already been made. Also, you obviously know your cooking style. I would like to add that maybe you would consider a prep sink on the island. If you are interesting in what more eyes might find re your layout, the gardenweb kitchen forums are a fantastic resource. LOVE you plans! Kitchen remodels are so fun!! I too am a big fan of dark cabinets and I decided to do white on the uppers in my remodel to prevent the space from feeling too heavy. I also went with a white quartz which I am super happy about! Here are a few shots of our kitchen with the combo light & dark cabinets. Good luck!! http://www.houzz.com/ideabooks/7483092/thumbs/kitchen-before-and-after. I’m always hesitant to mix finishes in a kitchen so I can’t wait to see how it turns out! Love the soon to be new kitchen. Question about the range wall – are you doing a backsplash? As the focal wall, that kind of seems like you either need to do the whole wall, or are you just planning on one of those stainless panels between the range and hood? Also, I know this is getting into the nitty gritty, and I don’t know what the garbage/recycling/compost collection is in your part of the country, but the best thing we did was build pullout’s for all three into our kitchen remodel. Right now we have plans to tile the whole back wall. Not sure exactly with what yet. I think traditional 3×6 subway tiles would probably be too small and played out. But we’ll see. Also! The island has pull our sorting and garbage! We’re so excited. 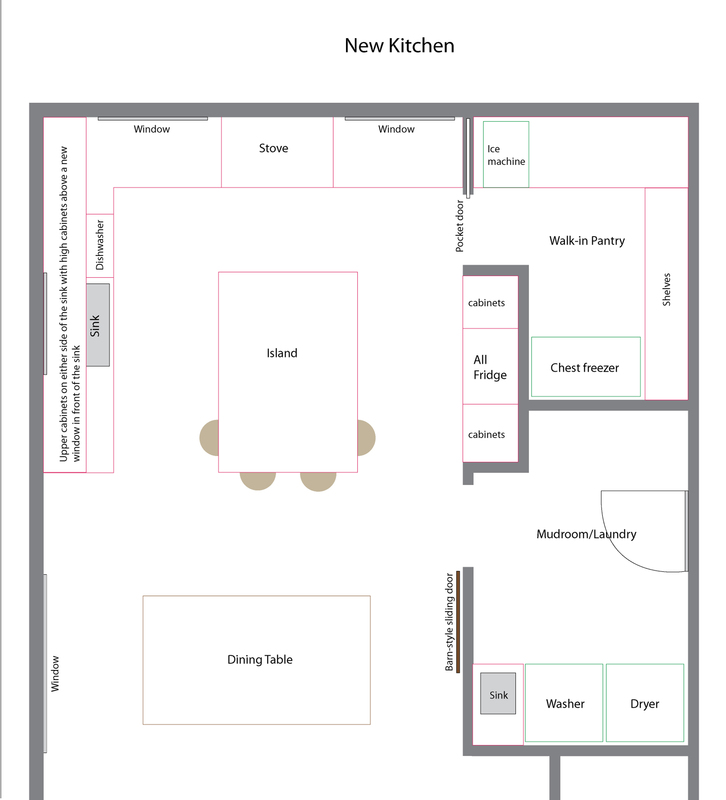 Love the kitchen plan! I’m surprised to read the comments against chest freezers, as I really like mine. When I was trying to decide between upright and chest there seemed to be quite a few negatives associated with uprights, they use more energy to keep cool, it’s more difficult to store bulky things like turkeys, they are on average more expensive, and most importantly for me (I live in a hot, hurricane-prone location) chest freezers can stay cold for several days during power outages. Mine also came with several large sliding bins for the top half to keep things from piling up! Can’t wait to see it all pulled together!!!!! You have a lot of black windows on your Pinterest board. Did you consider doing black windows since you are putting in 2 new ones?! Our kitchen window really needs replacing and I want to do black but I also want to do plantation blinds so I feel like that limits me to a white window. I LOVE the look of black windows, but with black cabinets, we decided to keep them white. Also, I would feel weird about just having a few black windows in our house. Mixed metals I am on board with. Not sure about mixed windows. Haha. Hi Julia, I love that you are using the new IKEA line. I remodeled my kitchen last spring using IKEA and love our cabinets (the soft close drawers, the euro hinges, and especially the coordinating organizers). They definitely help with keeping the budget in check while customizing everything they way you choose. Speaking of budget, do you guys have a budget in mind? I am always curious about that for projects like this on blogs, since so many of us get some many ideas from your sharing with us! Thanks! The budget is still evolving so I don’t have a straight answer for you right now. We’re looking at about $10K-$15K without appliances right now. Still sourcing things (including appliances) on ebay. By the end of it all, we’ll have a total for you! This looks great! I have two comments though. You know that IKEA totally changed their kitchen line this month, right? All the dimensions are different and will not work with the old cabinet boxes. I don’t know if the planner has been updated or not, so I thought I would throw it out there. My second comment is that although I love the look of having the cabinets go all the way down to the counter on the sink wall, there is not nearly enough room left for the dirty and clean dish continuum. At least not as it exists in my house :) Best of luck. It is going to be fantastic. Just to add my two cents, at our old house, we had cabinets down to the counter by the sink. No problems with space for dishes. My only concern would be the cabinets above the sink window. Maybe because I’m short, and I’d need a step stool to reach. I’d just worry with 8 foot ceilings, it’ll make the space feel closed in. At any rate, I think it’ll work so nicely. I’m with Tracy on the upright freezer, a bazillion percent! I had a chest freezer but it became nothing more than “a place where good food goes to die”… Lost so, so, sooo much to freezer burn because I couldn’t be bothered to dig through it. Now I have a counter height upright freezer with 4 drawers in my basement. I use 1 drawer for soups, stock and broths, 1 for stews, casseroles, oven-ready meals, 1 for dog & cat food (I cook some of my pet food) and 1 for everything else. I do have an upright fridge-freezer combo in my kitchen, there I keep pizzas, vegetables and the overflow (that I use regularly) from my basement freezer. I will never, ever go back to a chest freezer. if I need more freezer space then I’ll invest in a full height upright instead! The new layout looks so, so much more functional than your current kitchen. Question, could you use your old fridge/freezer combo in place if the chest freezer? Not sure what your dosing is, but you’d get the freezer and you could use the fridge for beverages. If it has an ice maker, you’d have that too. I’m so envious of your sconces! As much as I wanted a pair flanking our sink, it just wouldn’t work. Not enough room to add them in. Womp womp. Anyway, excited to see everything!!! Our current fridge/freezer is as good as toast. It has wires coming out the top. The ice maker/water dispenser doesn’t work. It’s bulging on the front and we cannot stand the side by side layout–no space for anything! I don’t even think we could sell it. Haha. Love your plans! 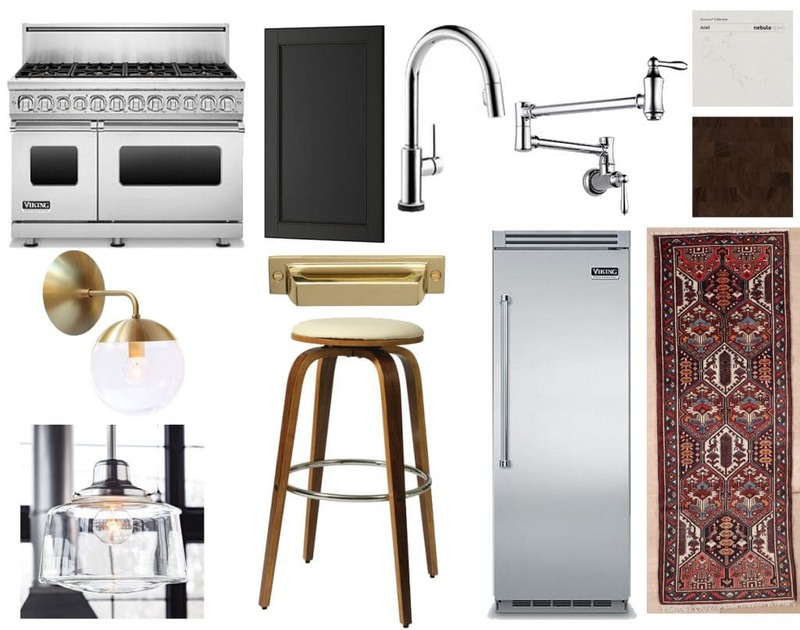 Are you going to get the faucet and pot filler in the gold color? I’m designing my kitchen and am stuck on which faucets to use with gold hardware, or mix metals. Nah. We are all about the mixed metals. Still going between chrome or stainless. 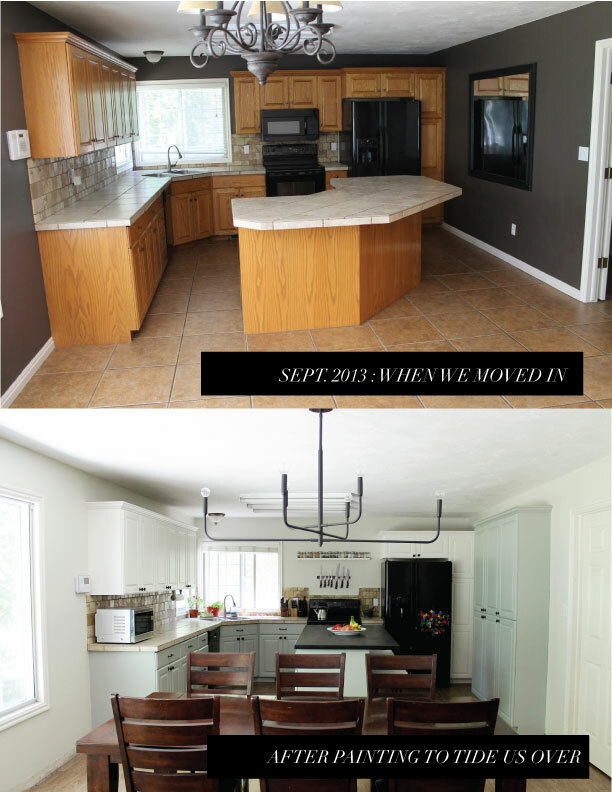 First I love the transformation your kitchen has already made! And I can not wait to see the new one!!! My new favorite look for a kitchen is white upper cabinets and dark walnut bottom cabinets with a white counter-top, dreaming over that one. I really LOVE your idea of putting a chest freezer in the pantry, wish I could do that. Look forward to the new kitchen! If the new walk-in pantry backs up to the garage, you could put a little swinging doorflap in so you could slide groceries in the pantry room directly instead of lugging them through the mudroom and around the corner into the pantry. More efficient, and kids might be more excited about carrying groceries through a “secret door”. Ahhh! Love the plans. It’s going to be beautiful – all that extra light will be amazing. Love what you’re planning. And, how jealous am I of that pantry w/ a freezer (btw, I second the previous suggestion of doing an upright freezer)? I can’t wait to see this all come together. My husband and I are in the planning stages of our own kitchen reno so I’m hoping your experience will help bolster my confidence that we, too, can pull off most of the work ourselves with 2 little ones running around. I’m tired just thinking about it. Great question. There are a few advantages, most of which are easily accomplished even without a pot filler. One example would be this pot that I have. My mom bought it for me while I was in college because she knew I liked cooking for large groups of people. Well I still love cooking for large groups and I use this pot every time. It’s huge, and doesn’t fit in our sink, so I use the sprayer/hose on my sink and it takes forever to fill up. Not a big deal, I can still make my food just fine but a pot filler would make it more convenient and faster. Another example would be soup. For most of my soups, I brown meat/sweat onions/saute veggies before adding water. Right now I either carry my hot pot to the faucet to add water or I fill up a jar several times and add the water to the soup. None of these things are difficult, and most people don’t think twice about little annoyances like this. aha! Excellent points (that I’ve never considered). The soup angle is especially convincing. Thanks! looks amazing! can’t wait for the big reveal! can I ask what program you used to sketch the kitchen layout? is that also the ikea kitchen planner tool? thanks! We just used Illustrator because we’re comfortable with that. But, we’ve used Floorplanner.com in the past and it can provide a more accurate layout. Thank you so much! This will be a huge help for my own remodel! So, I have to ask :) Did you know the big cabinet switch was coming at Ikea and plan accordingly? I’m SUPER excited to see someone using their new line so soon – can’t wait!! Good question. We actually didn’t consider Ikea until we saw their new line! Chris had drawn up specific plans for spice storage and pan storage and I had dreams of a little mail holding center and their new line has everything we wanted. So happy we waited! Good suggestion! Chris grew up with a big spare chest freezer. I grew up with a spare upright. I don’t think we’re set on one or the other–so these suggestions are more than welcome! I agree with Tracy, upright freezers are awesome and still hold a lot of food. We order half a beef from a local butcher each year and have room to spare in our upright. Plus they are easier to keep organized….no digging to the bottom. Happy Planning! The new layout makes so much sense. 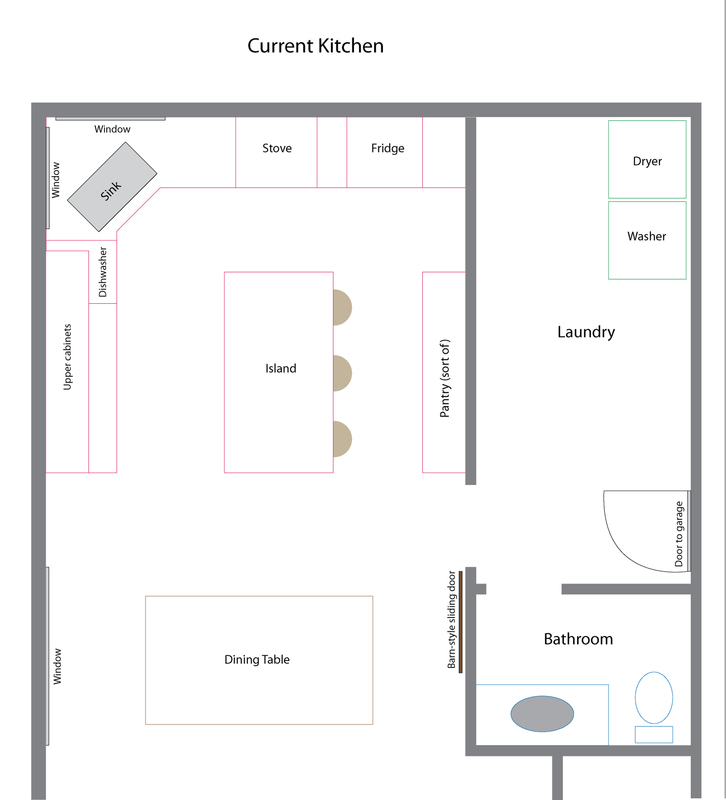 Your old laundry room took up a TON of space and if you already have another half bathroom on the main floor, why on earth did they put a second bathroom? Weird. I love the dark cabinets! And seriously, that oven! What a dream! and an ice machine!? YES! I love it and can’t wait to see it come together. This is gonna be so good, it makes so much more sense. I especially love the windows and awesome pantry. I did my kitchen in the past few years. Not sure if you have settled on the stone but I put in Quartzite (not quartz, they are different) and LOOOOVVVVEEE it. My stone looks like this Madre Pearla.- http://031dba3.netsolhost.com/p_images/Madre%20Perla%20500x336x7s-46909.jpg. Most quartzite is pricey but is super durable, harder than granite, does not stain, can handle heat etc. All the beauty of marble without the hassle. Also, I put in 2 dishwashers. Best decision ever. I have 3 kids and we always have a empty dishwasher to put dishes in, can handle large parties, etc. It might seem a little over the top but its not much more to put in another dishwasher because you are eliminating the cost of a 24 inch cabinet. Food for thought. Your plans look amazing!! Chris has been pining for one of those two drawer dishwashers, but my parents have one in their new house and I just don’t love it. I have never heard of actually having two full-sized dishwashers! I bet that is nice. Haha. The countertops aren’t set in stone (har har) yet, but we like the look of an almost all white stone with very little veining. We’ll see. Love it! That walk-in pantry is going to be to die for. And an ice machine!!! That butcher block will look great with your sliding door, too. It will be fun to see this project unfold, especially since there’s so many dramatic changes! I know! It’s gonna change everything. Oooh, your kitchen is like the mysterious brooding cousin to our kitchen! A lot of similar finishes, but used in very (very!) different ways. Excited to see it come together! Haha! I love that description. Wow, this looks so cool. The windows especially – the room will feel so bright even with dark cabinets. Are you planning to use contractors for everything, or DIY some stuff yourself? I know some people install Ikea cabinets themselves, but it depends on your layout and configuration. Looks like a great project and I can’t wait to see it all come together.